A lot of people struggle with their weight; in fact, obesity is one of the biggest (figuratively and literally) health related problems in the Western world today. Because it’s something we can see, many of us are more aware of obesity as a health issue than other high risk factors, such as smoking. It’s only logical, therefore, that a lot of apps are available to help users lose weight. Today we’re taking a closer look at DietPoint. Start off by setting up your profile: give specifics regarding your age, height, weight, gender and ‘activity’ (ranging from no sports to extremely active). Your Body Mass Index (BMI) and Basic Metabolic Rate (BMR) can then be calculated. The latter is not as well known as the BMI, but basically the BMR is the amount of energy needed for a passive organism to be able to sustain all of its vital functions. Determining how much energy is needed on a daily basis in order to maintain a set body weight is also important. BMI: 29.4. Average weight would be 18.5 - 25; 25 - 30 is slightly overweight, everything that follows in steps of five is Adipositas I, II and III. BMR: 1750 kcal are required if the subject is physically active. Daily energy consumtion: The subject’s weight will remain constant at 2100 kcal per day. Blood group diet: The premis to this diet is that individuals require certain nutrients according to their blood group. (BTW: While there may be a grain of truth to this, but most studies have refuted the notion.) People with blood types O, A and AB are advised to avoid milk, meaning that approximately 80% of the population of the Western world should stop drinking milk. Interestingly, Asians are often lactose intolerant, and yet many of them have blood type B. Low cholesteral: This can be seen as a long-term diet, the aim of which is to keep the intake of cholesteral low. Detox: Fresh produce are said to draw toxins fromt he organism and help lose excess weight. Dukan: A diet that’s high in protein and low in fats and carbohydrates. Phase 1 is the most difficult, as food intake consists mainly of proteins. Phase 3 and 4 serve to exit the diet slowly, so as to avoid the yoyo effect. Healthy: Regular training and a balanced diet. HCG: Follow this diet in conjunction with medical observation: very few calories and significant weightloss. Should not be applied on a long-term basis. Montignac: Only a small reduction of calorie intake, the difference being that only healthy produce are administered. The aim is to decrease weight slowly but steadily. Paleo: Helps avoid ‘contemporary’ eating behaviour, i.e. behaviour generated by industrialisation. Once you’ve selected a diet you can determine when it should begin, as well as when meal times should be. Even Facebook notifications are an option! Diet plans show all meal times, grocery lists and (if set) alarms for meal times. Helpful hints as far as nutrition and physical activites go are also included. If you like you can set up your own profile and play an active role in the forum. 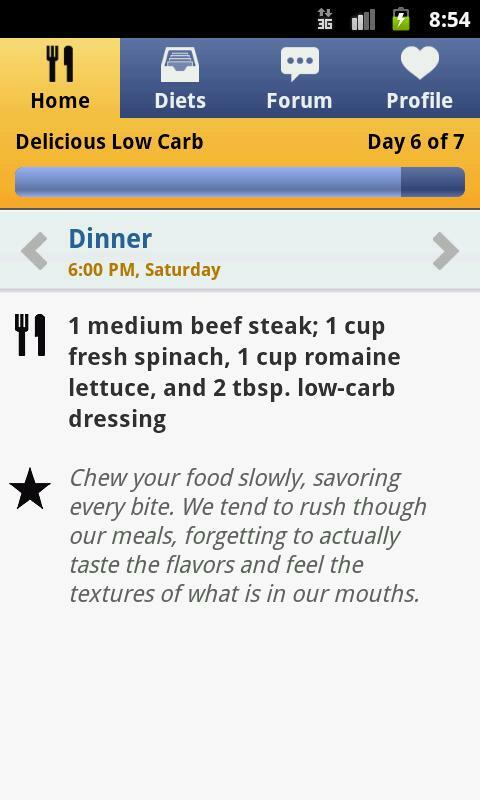 An absolute cherry on top would be if the app came with recipes to go with the different diets. 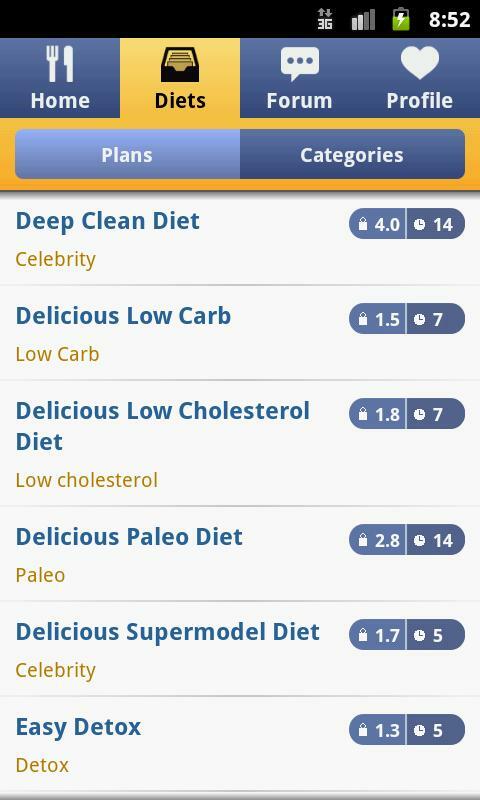 DietPoint provides users with lots of interesting diets and a sound dietary plan. The forum is also pretty neat. The only the thing that’s missing (the icing on the cake, so to speak) are recipes for meal times, calorie amounts included, naturally. DietPoint is set up in a very logical way and hence easy to navigate. The categories Home, Forum, Diets and Profile are shown at the top of the display. DietPoint performs really well on the Nexus S.
DietPoint is available for free from the AndroiPIT App Center and the Android Market. Several functions are missing in the free version, and there are ad banners to contend with. As an alternative: premium membership costs EUR 1,99 for 1 month, EUR 3,99 for 3 months or EUR 8,99 for forever. New diets are released every two weeks.